Banana nut muffins are the way to go for busy mornings and for a filling, sweet treat! 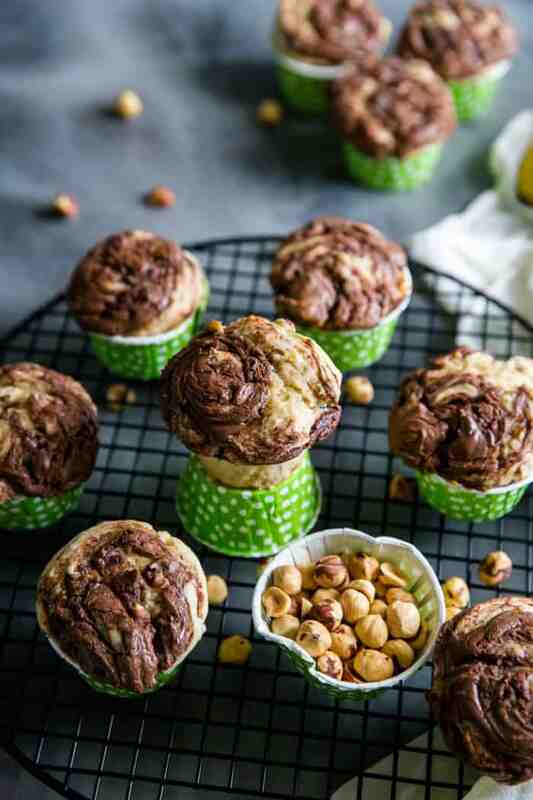 These banana nut muffins have chopped hazelnuts as well as a swirl of hazelnut spread! What Are Banana Nut Muffins? Banana muffins are soft and tender and are made sweeter with the addition of ripe bananas. The nut most often paired with banana nut muffins are walnuts, but pecans probably come in close behind. The truth is, you can use almost any nut you would like. You could also add in extras like chocolate chips or shredded coconut. 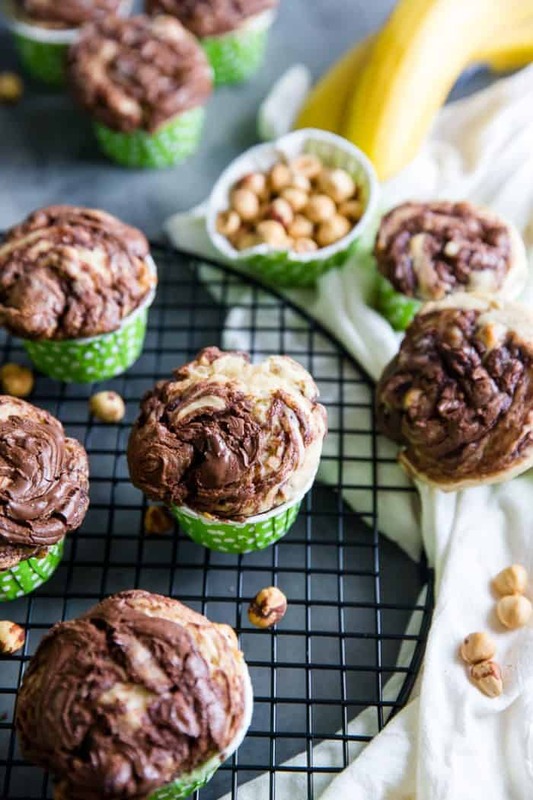 If you want to make muffins that feel like dessert, then you could throw in some chopped chocolate bars like Reese Cups or Snickers. This banana nut muffin recipe is pretty basic; flour, baking powder, and salt are added to butter and sugar. I used 1 cup of mashed bananas which add a natural sweetness and moisture to these muffins. I mixed in chopped hazelnuts to the batter and right before baking, I dolloped a generous spoonful of Nutella on each muffin! This recipe only yields regular-sized muffins. But you can easily double the recipe or make mini muffins instead. The Nutella can easily be omitted. Peanut butter would be a great add in too. WHERE IS THE BANANA NUT MUFFIN RECIPE? 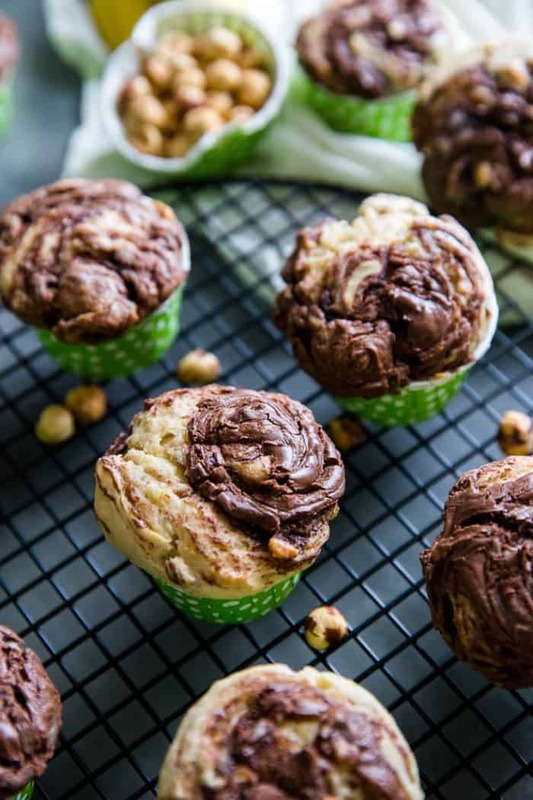 If you’d rather skip cooking tips, suggestions, handy substitutions, related recipe ideas – and get straight to the Hazelnut Banana Nut Muffin Recipe– simply scroll to the bottom of the page where you can find the printable recipe card. How To Store Banana Nut Muffins? These muffins should be stored in an airtight container. They will keep for about a week. These muffins are so good, they may not even make it a whole week! Love Banana’s? Try This Mini Banana Cheesecake Recipe, Toffee Banana Poke Cake, Banana Breakfast Bars, Banana Oatmeal Cookies. Banana Split Banana Bread. Banana nut muffins are the way to go for busy mornings and for a filling, sweet treat! 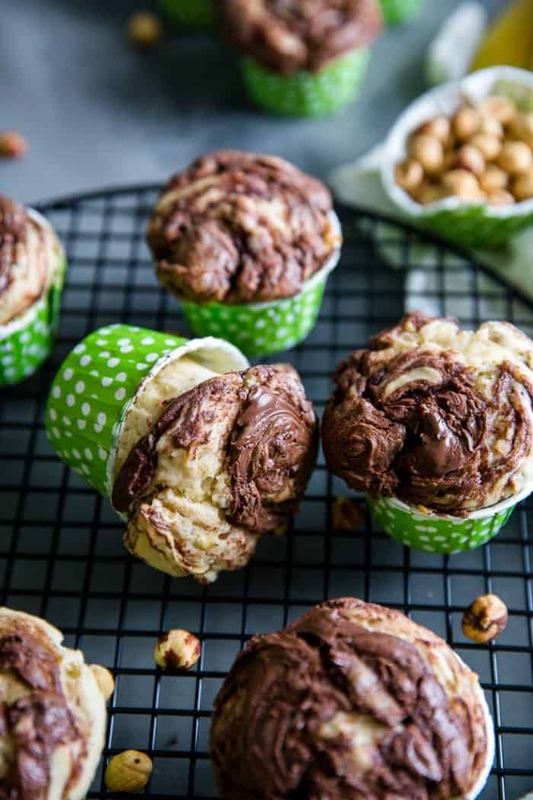 These banana nut muffins have chopped hazelnuts as well as a swirl of hazelnut spread! Preheat the oven to 350 degrees. Line a 12 cup muffin tin with liners and set aside. In a bowl combine the flour, the baking powder, and the salt. In a mixing bowl, cream together the butter and the sugars until fluffy. Beat in the eggs, the bananas, and the vanilla until smooth. Slowly add in dry ingredients until blended. Stir in the hazelnuts. Divide the batter between the muffin tins. 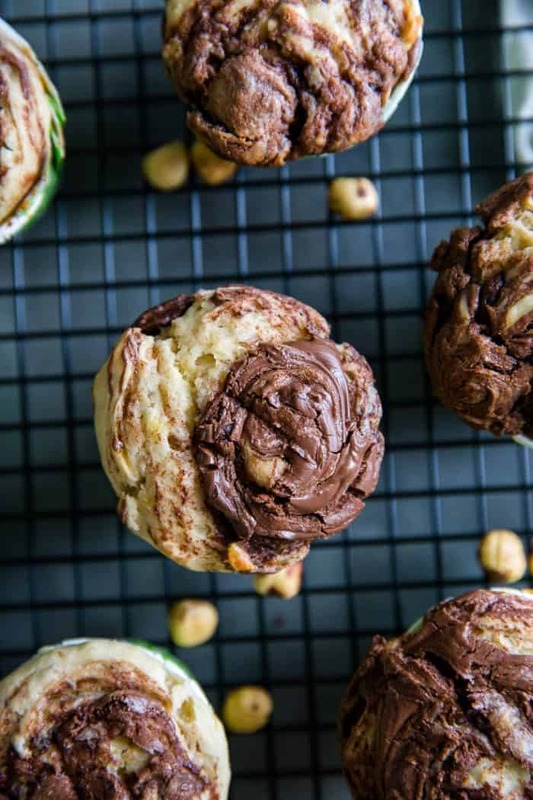 Place a dollop of Nutella on each muffin and swirl with a knife. Bake muffins for 22-25 minutes or until a toothpick inserted comes out clean. 3/8 a cup of Nutella is about a half a tablespoon of Nutella for each muffin. 3/4 of a cup of Nutella is 1 tablespoon per muffin.